The biotech industry has already remade the city. Now these startups and researchers are reinventing how we fight this insidious disease. Maryam Rahimian, a lab technician at Beth Israel Deaconess’s Cancer Center, shows how to prepare a personalized therapeutic cancer vaccine. MARY GOODING MADE THIS TRIP alone, listening to NPR as she drove up Interstate 95 in June 2017 on the way from her home in Jamestown, Rhode Island, to Dana-Farber Cancer Institute. On previous trips she’d prayed or chatted with her sister as a distraction. She felt she was through the worst now, six months since an X-ray revealed her persistent cough was caused not by pneumonia or bronchitis, but by a case of melanoma that had reached stage four. Then 60, Gooding knew melanoma well, a byproduct of childhood summers spent poolside at the Warwick Country Club with her eight siblings, even though, she says, “I’m so fair-skinned I get sunburned under a light bulb.” She’d first been diagnosed with the malignant skin cancer in her 40s, and had gone through three surgeries to get rid of various reoccurrences. But this time the cancer had invaded her lung. “That,” she says, “was the first time I’d faced my mortality.” A surgery earlier that spring had removed the bottom half of her left lobe. But if the cancer returned, well, there is only so much lung that a person can live without. Her best chance to prevent a recurrence was at Dana-Farber, where she’d qualified for a clinical trial being run by Dr. F. Stephen Hodi, the head of the hospital’s Center for Immuno-Oncology. Hodi had used samples of the tumor removed from her lung to create an implantable vaccine that would, in theory, help her own immune system fight back should the cancer return yet again. We usually think of vaccines preventing a disease, but therapeutic vaccines such as the one Hodi is testing boost the immune system of patients who, like Gooding, have already experienced the disease. That morning she’d get a 1-inch incision in her upper left arm, in which the vaccine — a sponge-like device about the size of a baby aspirin — would be implanted, then closed up with a few stitches. The procedure itself would take just 15 minutes. She’d have three more vaccines implanted that summer, in her right arm and in each of her legs. Once implanted, the device functions as a sort of boot camp for dendritic white blood cells, the “teachers” of the immune system. It draws in the dendrites — nearly 150,000 of them a day — and trains them to identify any malignant or cancerous cells the patient might have. Those trained dendrite cells migrate to the nearest lymph node, where they teach the immune system’s soldiers — T cells — to hunt down the malignancy. An implantable vaccine could be the future of fighting myriad types of cancer. Gooding’s hope was merely that it would work for hers; she’ll only know it did if she doesn’t get melanoma again. MASSACHUSETTS HAS AN illustrious history of fighting cancer. In the 1940s, a young Massachusetts General Hospital doctor named Saul Hertz pioneered the use of radioactive iodine to treat patients with thyroid cancer, a precursor of today’s precision medicine. Around the same time, Dr. Sidney Farber, treating children with blood cancers who couldn’t be saved by surgery or radiation, turned to chemicals, using aminopterin acid to treat a Dorchester boy with leukemia — one of the first examples of what would become chemotherapy. Boston researchers have won Nobel Prizes for establishing the link between genes and cancer and for discovering the genes that control the immune system. Every breakthrough drew more researchers and entrepreneurs to the area, and now the cluster of academic labs, research hospitals, and corporate research centers in and around Boston has made biotech the region’s driving industry, and increasingly part of our identity. “What oranges are to Florida or corn to Iowa, that’s what biotech is to Boston,” says Bob Coughlin, the president and CEO of the Massachusetts Biotechnology Council. Our biotech industry is pulsing with unprecedented creativity — and money. And cancer research is front and center. Scientists in Massachusetts received $420 million from the National Institutes of Health in 2016 for cancer research — more than any other state. A third of all biotech companies based in the Commonwealth are working in oncology, and of Massachusetts startups to go public in 2017, 40 percent were focused on new cancer therapies. In other words, Boston is helping to revolutionize cancer treatment, and not just thanks to the usual suspects. Mary Gooding’s implantable vaccine was initially conceived not by cancer biologists, chemists, or research doctors, but by an expert in biomaterials at Harvard University. “To develop new technologies for diagnostics and for drug delivery and to create new therapies for treatment, we need cancer biologists to work with cancer-oriented engineers,” says Tyler Jacks, the director of MIT’s Koch Institute for Integrative Cancer Research, which enlists nanotechnologists and big data experts to bring new ideas to the fight against cancer. Mary Gooding talks with Harvard bioengineer David Mooney in his lab. He developed a vaccine implant being used to treat her melanoma. One intriguing idea to emerge from these new collaborations is a “liquid biopsy.” Researchers at MGH developed a technology to detect tumor cells before they can spread and grow in other organs. It’s being commercialized by TorpedoDx, a Charlestown startup. Another, out of Dana-Farber, is a profiling platform that screens tumor samples to look for a total of 324 gene mutations. That’s being developed by Cambridge’s Foundation Medicine, which received FDA approval for the platform last year. In June, pharma giant Roche paid $2.4 billion dollars to buy the shares of the eight-year-old startup it didn’t already own. And it’s hard to ignore the buzz around therapeutic cancer vaccines, spurred in part by Moderna Therapeutics, a Cambridge startup that also is developing vaccines for other diseases. At $7 billion, Moderna is Boston’s most valuable startup, and one of the most valuable biotech startups in the nation. Another vaccine developer, Neon Therapeutics — spun out of the Dana-Farber lab run by Dr. Catherine Wu — went public in June, hauling in $100 million. These vaccines represent a way forward for patients who’ve hit a therapeutic dead end, where surgery, radiation, and chemotherapy are no longer effective. We need these techniques because of cancer’s insidious ability to trick, evade, or shut down the immune system. Vaccines are just one kind of immunotherapy — a way of getting the body’s biological defense system to attack and kill cancerous cells. Others boost the immune system’s communications network or beef up T cells. Using the immune system is an old idea in oncology, stretching back to 1890. The next year, a Harvard-trained surgeon named William Coley treated a patient with sarcoma by injecting him with bacteria to spark an immune response. The patient, considered a hopeless case, lived for eight more years. Such early immunotherapies mostly didn’t work, and no one really understood why. In 1965, Coley’s toxins, as the approach had come to be known, were added to the American Cancer Society’s list of “unproven” therapies. But piece by piece, scientists starting putting together the puzzle of the immune system. Immunotherapies generally have two advantages over radiation and chemotherapy: They are not inherently toxic (though an overstimulated immune system can still be dangerous), and unlike drugs, they don’t just pass through the body. Once the immune system’s T cells have learned to identify a given threat, they provide ongoing surveillance and protection. The first wave of immunotherapies, known as checkpoint inhibitors, prevents some kinds of cancer cells from, in effect, silencing the immune system’s alarm bells. Their success in the last few years is one reason why research firm MarketsandMarkets is predicting the global cancer immunotherapy market will grow from $41 billion in 2015 to an estimated $91 billion by 2021. Another approach involves removing some T cells from a patient, programming them to hunt tumor cells, and then injecting them back into the patient. This method uses what are called chimeric antigen receptors, or CARs — signaling proteins on the surface of the T cells. 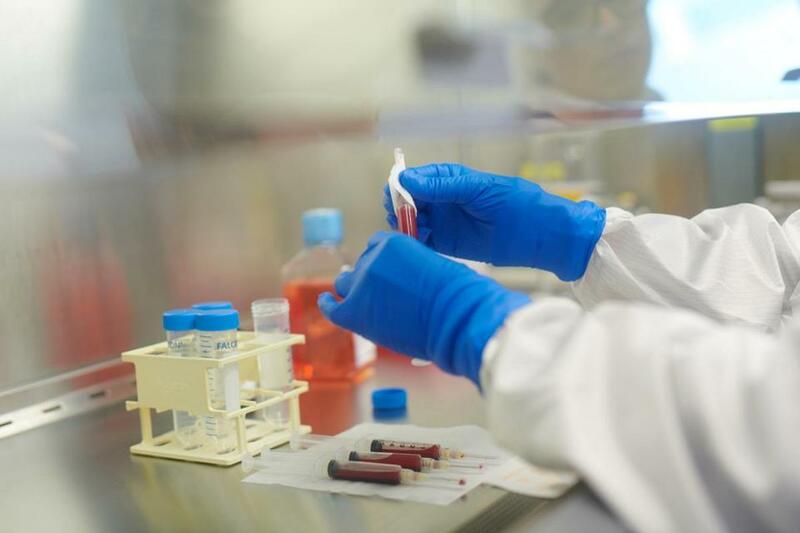 The first two CAR-T therapies on the market can have miraculous effects, but work for only a subset of patients and run close to half a million dollars per treatment. Which brings us to therapeutic vaccines. Like Coley’s toxins, cancer vaccines have yielded disappointing results. Only one therapeutic vaccine, Provenge, meant to help men with advanced metastatic prostate cancer, has been approved by the FDA, and it failed to live up to expectations, causing its developer to go bankrupt. The thinking now is that cancer vaccines need to be combined with other forms of immunotherapy, much like chemotherapy drugs are often more effective when used in combination. That’s what has people excited about emerging companies like Neon, and especially Moderna, which has huge ambitions. “We’re actually hacking the software of life,” Tal Zaks, Moderna’s chief medical officer, declared in a TEDx talk last November. “And it’s changing the way we think about prevention and treatment of disease.” Investors agree — the company has raised $2.6 billion, including $125 million from Merck in May (on top of a $200 million investment and development agreement two years ago) to expand their collaboration on vaccine development. Moderna has no therapies on the market, but 21 in its pipeline, 10 of which are in clinical development. In July, it opened a $110 million manufacturing facility in Norwood. Moderna takes tumor cells collected from a patient during a biopsy or surgery, then uses computers to sequence the DNA from those cells. Using algorithms Moderna developed to compare the tumor DNA to DNA sequenced from the patient’s healthy blood cells, it selects 20 mutations in the cancerous DNA most likely to be recognized as foreign by the patient’s own immune system. It then creates a vaccine specific to that patient that will show his or her immune system how to recognize the mutant proteins, and attack them. It’s a complicated approach. It took six weeks from the harvesting of lung cancer cells to the injection of the first dose of personalized vaccine in Moderna’s initial clinical trial, which started last fall. At the new Immunotherapy Institute at Beth Israel Deaconess, Avigan and his team are studying a simpler approach: Rather than sequencing tumor cells to learn exactly which antigens to build a vaccine around, the team simply extracts some of the cancer cells and fuses them with dendritic cells — the educators of the immune system — to create a hybrid cell. The hybrid is cultured and injected back into the body. Like Moderna’s vaccine, it is created for an individual patient. But rather than using computer power to determine the target, it leverages the immune cells’ inherent ability to identify antigens and to teach the T cells to go after them. 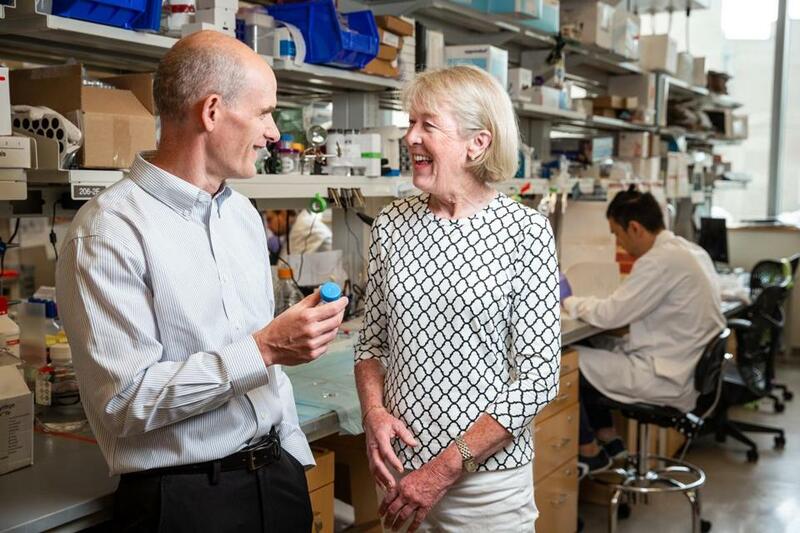 Avigan’s team has also trained groups from 17 cancer centers how to make their own personalized cancer vaccines, as part of the Beth Israel Deaconess lab’s clinical trial on whether the vaccines can be effective against multiple myeloma, a blood cancer. Patients with multiple myeloma can be treated, but they can’t be cured. And over time, the available treatments become less and less effective. Dr. Nina Shah jumped at the chance when she was invited to Avigan’s training in 2015. Shah, then at the University of Texas MD Anderson Cancer Center, wanted to add to their cancer-fighting arsenal, so she and some colleagues came to Beth Israel Deaconess. Avigan’s team walked them through the process of creating a vaccine from scratch. “They’d say, ‘OK, now you’re going to culture the cells like this and pipette like that and incubate like this,’ ” says Shah. When Shah took a job at the University of California at San Francisco Medical Center, she sent her new team to Beth Israel to learn the techniques. They receive kits that look at bit like Blue Apron meal kit box to make the vaccines, which they then send back to Beth Israel Deaconess for verification before injecting them into patients. To date, 180 multiple myeloma patients have been enrolled in the trial, which is expected to finish late this year. FOR ALL THEIR PROMISE, therapeutic cancer vaccines probably have years more trials to go through before receiving FDA approvals. And there are plenty of challenges to overcome, starting with simply finding the proteins responsible for cancerous growth. We don’t know which proteins cells use for many basic functions, including signaling other cells. That means we can’t necessarily control enhanced T cells so they only go after cancer cells. “If you have a T cell that’s really souped up and really effective in all the wonderful ways we want it to be, you don’t want that going after your heart or your kidneys or your lungs,” says Avigan. We also still don’t know why treatments work for some patients and not others. “We are very bad right now at predicting who’s going to respond to an immuno-oncology drug or who’s going to have a side effect,” says Dr. Barrett Rollins, the chief scientific officer at Dana-Farber. He envisions sequencing the immune cells of patients, and putting them in a database so researchers can see if patient responses vary based on specific immune markers. 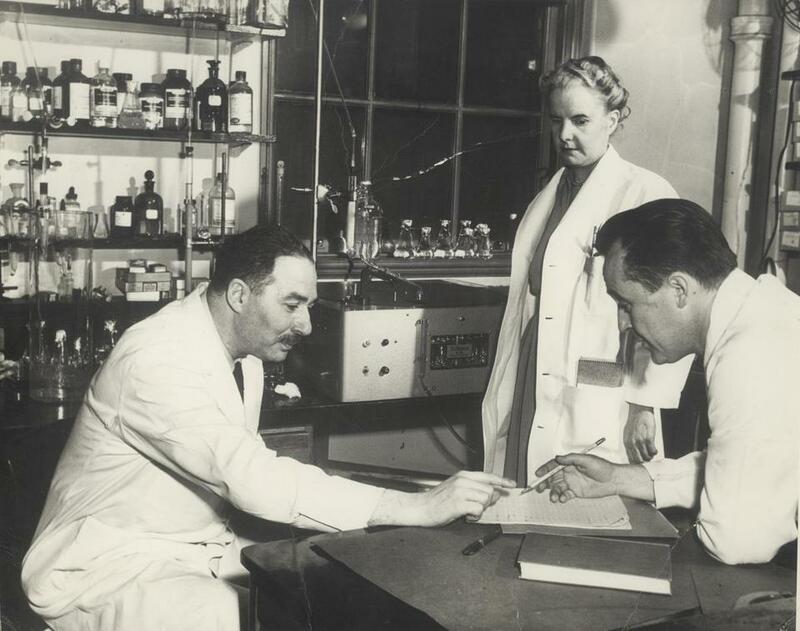 Dr. Sidney Farber, considered the father of modern chemotherapy, pictured at left with colleagues, circa 1950. None of this is cheap. But we’re seeing breakthroughs. Remember Provenge, the failed therapeutic cancer vaccine? It did help some patients, and attracted the interest of David Mooney, a Harvard professor of bioengineering. Mooney found the process of isolating cells from the patient, manipulating them in a laboratory, and then re-injecting them to be cumbersome and expensive, and wanted to develop a faster, cheaper process. He specializes in tissue engineering, and began working with the biodegradable polymer used for sutures to see if he could build, as he puts it, “a cell factory inside the human body.” Mooney’s work led to the vaccine that Hodi implanted in Mary Gooding, the melanoma patient, as part of the clinical trial. The trial is small and not yet complete, though it should wrap up by the end of the year. But this spring, Novartis, a big Swiss pharmaceutical whose biomedical research is headquartered in Cambridge, was intrigued enough to license the technology. Mooney, meanwhile, is working on second-generation systems, including a particle-based vaccine that could be injected and self-assemble, skipping the expense of creating an implant in the lab. If this treatment sounds like the future, it is. But it’s the future within reach. Gooding was among a couple of dozen patients to enroll in Hodi’s trial, and there are more than 50 cancer immunotherapy trials recruiting patients or ongoing in Massachusetts, with dozens focused on therapeutic vaccines. Cancer, little understood for centuries after it was first named by Hippocrates, often is no longer a death sentence. Yes, some 600,000 Americans will die of a cancer this year. But as of 2016, there were an estimated 15.5 million survivors living in the United States, a number predicted to top 20 million by 2026. And we can count Mary Gooding, who remains cancer-free 16 months later, among them.